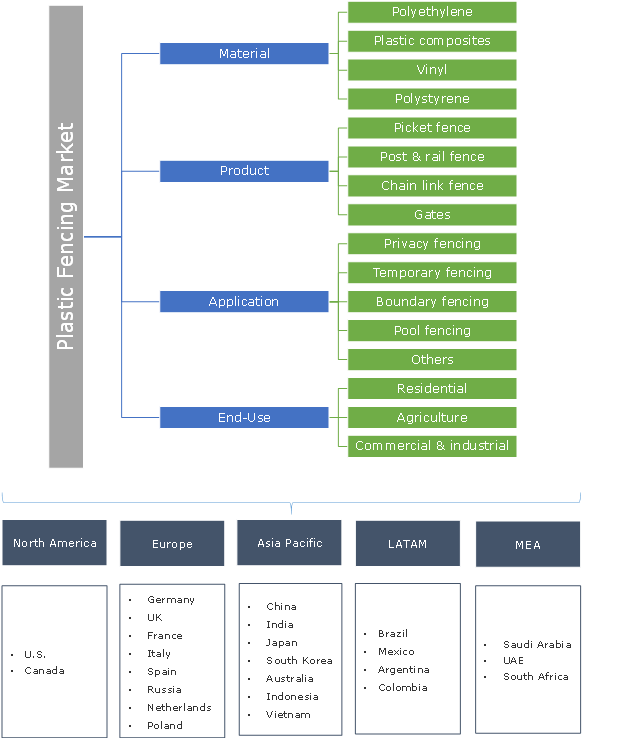 Global Plastic Fencing Market size was worth over USD 3 Billion in 2016 and will surpass 400 Million Linear Feet by 2024. 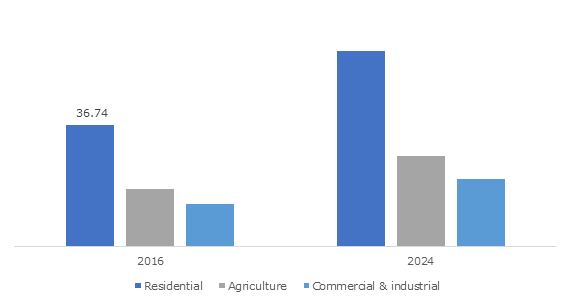 Potential outlook in renovation and new construction of residential and commercial buildings are key factors driving plastic fencing industry growth. Increasing consumer awareness pertaining to safety and prevention from theft will propel product demand. As per industry experts, the U.S. property crime rate per 100,000 population recorded 2487 in 2016. Enhanced security accompanied by low maintenance, high durability and cost-effective properties are key factors fuelling product penetration. Increasing infrastructure expenditure in private as well as public construction projects is expected to enhance industry revenue growth. As per analysis, global average annual construction spending was around USD 8.8 trillion in 2016. Global construction industry witnessed annual growth at 3.5% in 2016, due to rapid economic growth. In addition, continued opportunities from emerging Asian economies including India, China, Indonesia and Malaysia will significantly boost plastic fencing market size. Technological advancements and product innovations in the fence material will propel industry growth. Emergence of composite material mainly including wood-polymer composites has enhanced product demand. Shifting manufacturer focus towards development of composite based products to offer comprehensive styles and colours will support the market size. Superior resistance from decay, pests, corrosion along with excellent weather proofing properties as compared to wood, provides a positive outlook for product penetration. Reduced maintenance cost particularly in harsh climatic conditions where conventional fence rots and curtain lifespan will drive the industry size. Significant competition posed by the metal and wood fences may hamper industry growth. High demand for wood alternatives due to traditional and classic appeal, wide range designs along with notable mechanical properties may limit product demand. Fluctuating raw material costs due to instable crude oil prices are key factors influencing the plastic fencing market price trend. Vinyl fencing market is expected to surpass 200 Million Linear Feet by 2024. Increasing preference for vinyl products in both renovation and new construction projects due to its least maintenance cost and superior mechanical properties will drive business growth. Inclination towards aesthetically attractive and new backyard boundaries due to improving living standards will provide positive outlook for product demand. Growing adoption of innovative products including pre-woven vinyl fence and reflective fence coupled with increasing HDPE penetration will drive plastic fencing market growth. Increasing consumer preference for modular fence construction has further enhanced product demand. Plastic composites will witness CAGR at over 6% up to 2024. Rising product demand particularly in privacy applications owing to superior performance, high durability, reduced maintenance and cost-efficient properties will propel industry size. Moreover, excellent resistance against chemicals and severe weather conditions along with reduced usage of protective sealants and minimal environmental effects will support product penetration. Picket fence accounted for over 45% of the overall industry share in 2016. Potential applications in private residential buildings and out yards of commercial building are among key factors driving product demand. Superior mechanical properties due to pressure treated production process enhances the product durability. Picket is a decorative way to safeguard children and pets without obstructing views and are used around front as well as backyards. Post & rail will witness gains at 6% up to 2024. Strong outlook in farm and livestock protection coupled with growth in agriculture industry will drive product scope. Necessity for essential demarcation of a boundary and restriction of pedestrian access will boost industry demand. Post & rail are traditional & attractive fence style that has been a primary view of the English countryside communities across the globe. Privacy plastic fencing market will generate revenue more than USD 3 Billion by 2024. Increasing self-protection concerns along with rising consumer spending on residential and commercial buildings will support industry demand. Shifting trend towards nuclear families accompanied by increasing awareness about safety for children particularly in outdoors will propel product penetration. Temporary fencing is set to observe over 5.5% CAGR up to 2024 due to its extensive usage in wildlife parks, prisons, aquatic centres, military facilities, and airfields. Growing product demand on short-term basis in outdoor locations along with providing public safety in construction site locations is projected to fuel industry growth. In the present scenario, rising need for temporary barriers in industrial plant, quarry, high-voltage equipment areas and other factories will boost product demand. Residential sector catered for more than 50% of the overall industry volume share in 2016. Rapid population growth coupled with growing demand for housing will drive industry growth over the forecast timespan. Growing expenditure on residential renovations to ensure security and beautification will support industry growth. Shifting consumer preference towards eye-catching exteriors particularly in residential backyards has stimulated product demand. Agriculture is anticipated to depict over 5.5% growth up to 2024. Necessity to ensure protection of livestock, harvests and farm areas from wild animals and thieves has enhanced product demand. Increasing penetration of HDPE and vinyl in agriculture, field & horse fences will support business growth. Rising security concerns coupled with growing construction investments are key factors supporting product demand in commercial sector. Moreover, government investments to ensure security and safety at numerous public locations and parks will further stimulate overall industry growth. North America plastic fencing market accounted for more than 30% of the global industry share in 2016. High popularity for picket fence representing middle-class suburban lifestyle particularly in the U.S. will regional growth. Increasing consumer preference for recyclable polymer based products is among the key factor supporting product demand. Rising demand for decorative home products coupled with growth in residential construction industry are projected to contribute significant revenue growth. Favourable alterations in labour policies and taxes owing to political changes in U.S. presidential election and fall of Trans-Pacific partnership in 2016 are the key factors influencing regional industry demand. Asia Pacific market will witness growth at 6.4% up to 2024. Rise in consumer spending on home safety products due to changing demographic and income trends are among key factors fuelling industry demand. Expansion in construction industry coupled with government support regarding subsidies and modifications in construction laws will strengthen the industry size. Global plastic fencing market share is highly fragmented due to presence of large number of regional as well as international players. CertainTeed, Tenax Corporation, Durafence, Weatherables, Pexco and Veka are among key industry players. Other prominent participants include Associated Materials, ITOCHU, Walpole Outdoors, Seven Trust, Planet Polynet and Fogarty PVC. The manufacturers are focused in adoption of several expansion and growth strategies including mergers & acquisitions, collaborations, joint ventures, product portfolio expansion and supply agreements to improve their industry foothold. Shifting consumer preference for minimal maintenance, visually attractive and competitive priced products has enhanced the plastic fencing demand. Abundant availability of wide range of products with varying purposes, colours, and designs, along with customizable products and solutions offered will fuel industry growth. Moreover, rising security & transportation needs along with increasing construction investments are major factors promoting business expansion. Governmental initiatives to ensure security and safety at public parks and premises will further stimulate industry growth.